Group Leader - Stephen Corless. 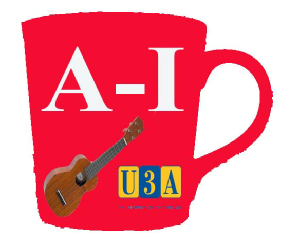 AIMUG Aston In Makerfield Ukulele Group meet every fourth Friday of the month between 1.00 and 3.00 pm at Captain’s Lane. The group welcomes all retired gentlefolk, whether you’ve played before, never played at all, don’t even know how to hold this instrument or are a bit of an expert. Full instruction will be given, along with a Beginner’s Book, a Mover’s On Pack, a CD containing all the songs in the Beginner’s Book to play along to and a Ukulele group pencil. You don’t have to sing along but try to stop yourself.